What is a Village Music Circle exactly? Experience the uplifting power of Team Building Through Rhythm! The steps involved in successfully creating music together as a corporate group result in synergy, camaraderie and increased well-being. As the team begins to play music together a common language emerges and communication improves. Individuals become a team and the team becomes a thriving community. The interaction and cooperation that unite a village into a successful social and economic entity translates into metaphors that apply to the corporate community. Through the creative process participants are removed from the business environment and co-create a fun and joyful musical village, deepening their community ties in the process. In a one hour program this hands-on, interactive experience can achieve a team dynamic that participants will then carry back to their everyday work environment and talk about for weeks to come. Village Music Circles™ facilitators work closely with your event planners to integrate your program objectives into our Village Music Circles™ format. Drawing on extensive experience, Village Music Circles™(VMC) facilitators provide professional leadership in a corporate environment. VMC Facilitators are trained in the specialized skills needed to lead business professionals through an effective experiential team building process using rhythm and music. Village Music Circles™ provides instruments for all participants. Congas, Bongos, Dunbecks, Ashikos, Talking Drums, Frame Drums, Bass Drums, Shakers, Rattles, Bells, Woodblocks, and Boomwhackers. 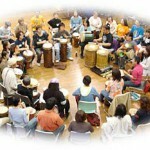 Village Music Circles™ programs range from 5 to 6000 participants and are customizable to meet your unique needs. Contact us for more information – VMC will bring your organization an exciting and impactful Village Music Circles™ Team Building Experience.